Makelar Tjerita: Jazz with Javanese Taste, its Ngayogjazz! Jazz with Javanese Taste, its Ngayogjazz! As the November comes, the most awaited jazz performance event, the Ngayogjazz, is finally ready “break the rule” of the common Jazz Festival! Its free and its so Javanese ;). With the tagline of, Dengan ngejazz kita Tingkatkan Swasembada Jazz (through the Jazz, we increased the self-supporting Jazz) Ngayogjazz 2012 will be held on Sunday,November 18, 2012. This year it’ll be held on Desa Brayut, a village near in the outrkirt of Jogjakarta. Well, it takes me back to the memories of Ngayogjazz 2011 when it was held in Pasar Kotagede, a traditional market encircled with the local kampong. one of the raising star in Semarang City nowadays. Jazz music where always find its spontaneity, being interactive, expressive and friendly, and through the ngayogjazz all of this aspect is fulfilled. The event itself its free of charge, accommodating the local performer, and has its own characteristic as Jazz in the Javanese land, not those from the west, that’s the main differences. In the Ngayogjazz 2011, I accompanied by my friends Wisda, Bagoes and Ikhsan also with my Russian friends, Sasha, depart from Semarang city on the noon, and arrived in the venues on maghreeb time, around 6 pm. 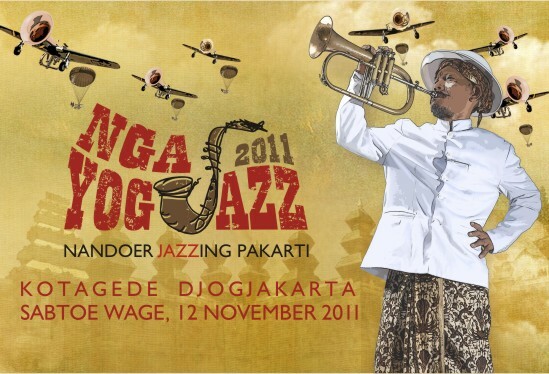 Soon we experienced the mystical and magical jazz spirit courtesy of Ngayogjazz 2011. A stage in the middle of kampong, a stage in the parking lot of traditional market, it’s a jazz fest but there’s a lot of tradional food seller with their gerobak(cart) on it, really unbelievable where the music that a lot of people see it as the identity of the high class society, then we could see it in the condition like this.